Broner is just 29 years old but he looks to be on his last legs as a prizefighter with this particular performance. Still, that didn’t stop the Cincinnati native from declaring that he deserved to win on Saturday. Now the question comes down to whether or not we will see Pacquiao step back into the ring to face off with his nemesis Floyd Mayweather. 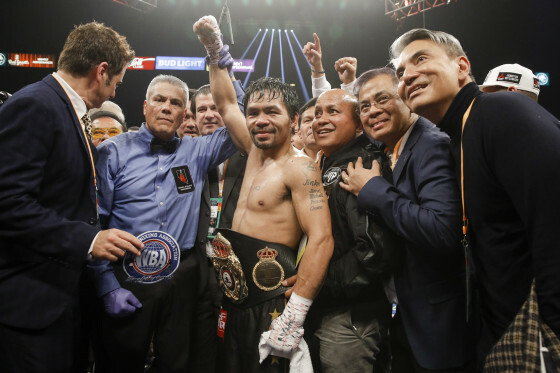 The prospect of Pacquiao facing Mayweather was the talk of the boxing world for several years until the two men finally met in May of 2015, with Floyd walking away with a unanimous decision victory. If you ask Pacquiao, he’s more than ready for another go with “Money”. Prior to his showdown with Broner, the odds heavily favored Pacquiao, according to the latest statistics from the MGM Grand. Favored at -280 to win the contest (-120 via decision), Pacquiao made anyone who bet on him a winner when all the dust had settled. But what do the odds makers say about the possibility of Pacquiao facing off Mayweather later this year? It’s hard to say, but one thing that is for certain is that the ball is once again in Mayweather’s court.